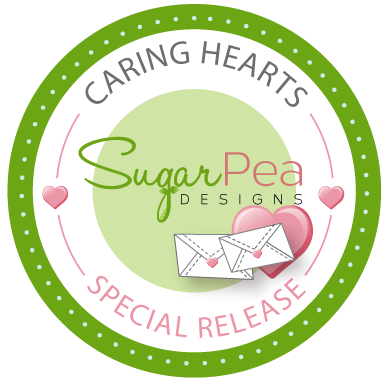 SugarPea Designs Caring Hearts Special Release Blog Hop! Hello and welcome to SugarPea Designs Caring Hearts Special Release. 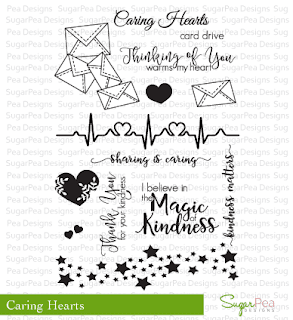 I am so excited to join this list of FABULOUS ladies for this special hop in celebration of the upcoming 7th annual Caring Hearts Card Drive. 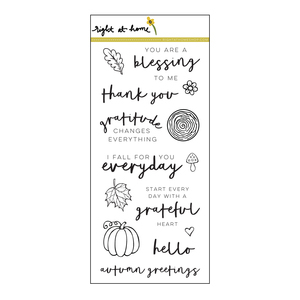 Vera (the mastermind behind the card drive) and Jennifer McGuire along with their team of volunteers will be collecting handmade holiday cards for the elderly that live in nursing homes from October 1 to November 25. Vera will have all of the card drive details up on her blog on Saturday, Oct. 1, 2016. SugarPea Designs will be donating 20% of all proceeds from the sale of Caring Hearts stamp sets & dies to the Alzheimers Association. 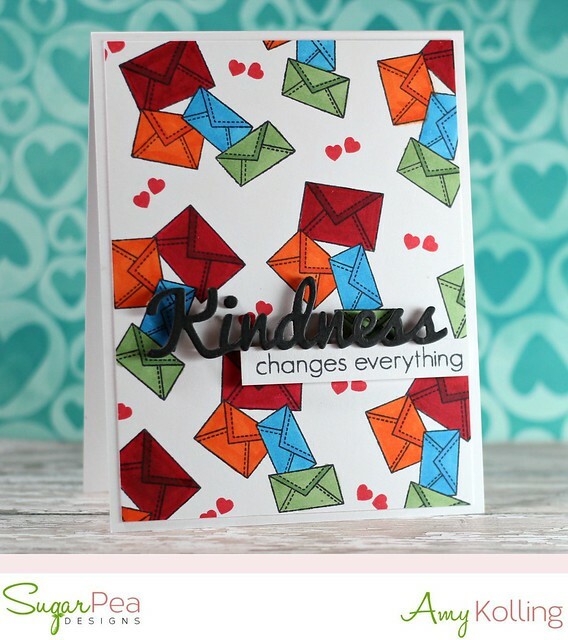 My first card uses my favorite sets from this special release: Kindess and Caring Hearts. 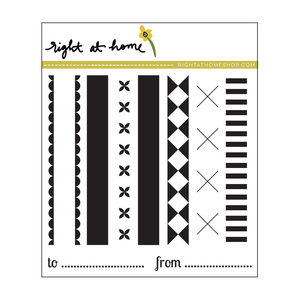 Each stamp set has a coordinating die but I've combined these 2 sets here. I've stamped many of the envelope groupings and then Copic colored them all in. Tedious but well worth it! 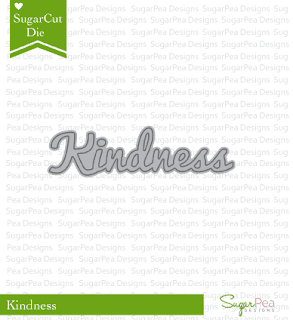 My "Kindness" die cut was cut multiple times and layered for dimension. My next card uses the other DARLING set called Caring Critters. I used the red gingham paper from Countryside Charm papers along with the Heart Journal Card Sugar Cuts. My stitched hearts were diecut into a white panel and then added with foam adhesive for a window look. The cute dog was Copic colored, die cut, and added with foam adhesive. Now.....let's get to the hop! SugarPea Designs is giving away the entire Caring Hearts release (3 stamp sets & 3 SugarCuts dies) to one lucky commenter. Readers have until October 7th to comment. 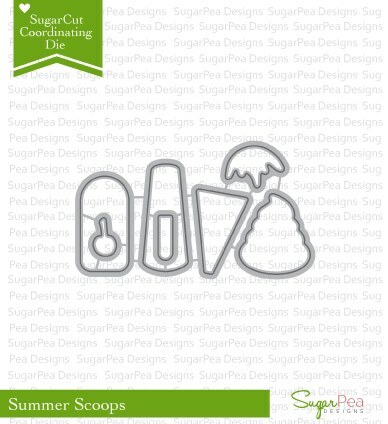 Vera will randomly select from comments left on hop participants to give away a $25 GC to the SugarPea Designs Store. Hello! 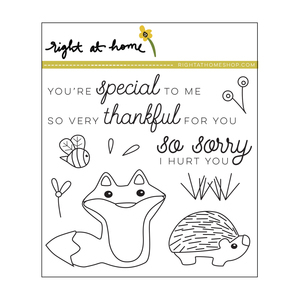 Today I am sharing this card made with the adorable new set from Right at Home called Friendly Fox along with a few other must have sets from the Fall Release over on the Right at Home blog. Come on over and visit! 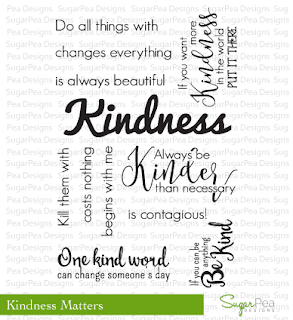 This month I focused on the popular older product called Stitched Tags Die. 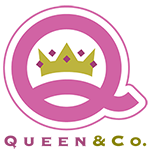 Stop over at the Pretty Pink Posh blog for the rest of my project! Hello! 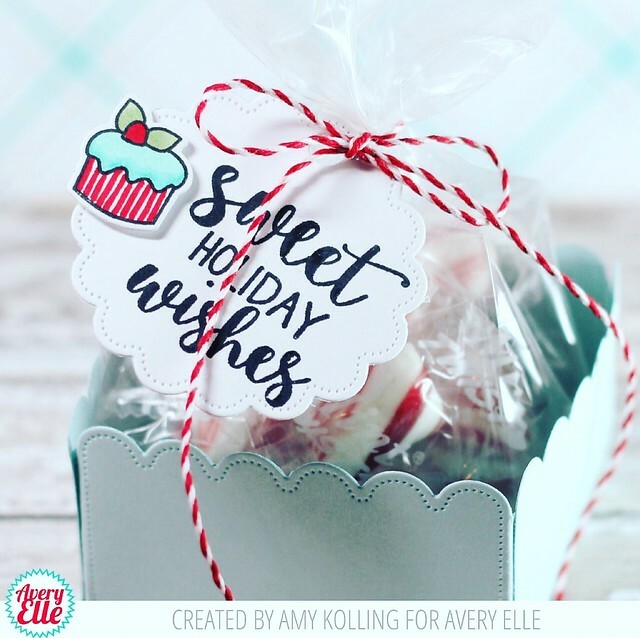 I'm slowly getting in the holiday mood for cardmaking.....I'm guessing it's the fabulous release from Avery Elle!!! You need to go check it out. Here I've used it on some light blue cardstock and ran the Falling Snow die through 3 times to get an almost full "snow" background. To finish the snow effect, I added some Prisma Glitter on the snowy parts of the house. Hello! I'm here to share a card made with a NEW exclusive stamp set from Pretty Pink Posh for the huge Stamptember event over at Simon Says Stamp! 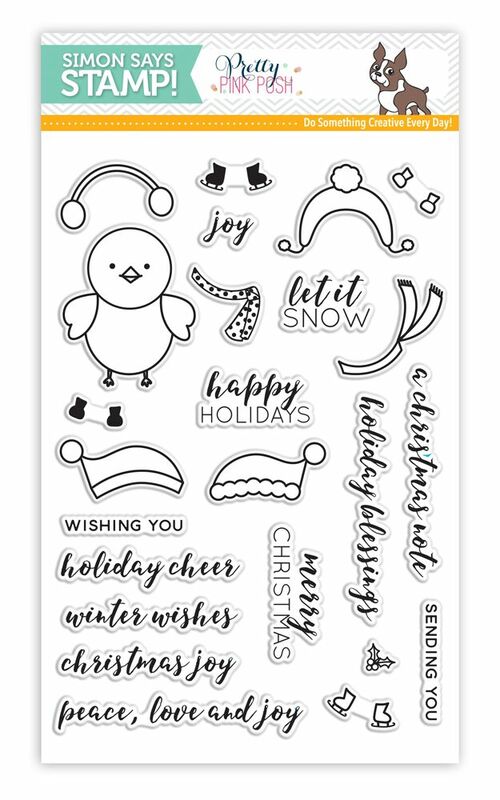 This adorable new stamp and die set called Winter Bird Friend can be found HERE and psst......there are coordinating dies too!! 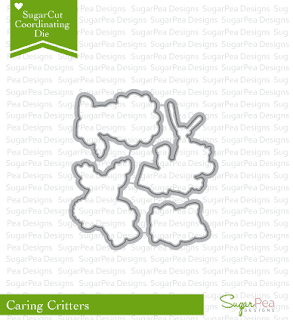 To create my wintery scene, I used the Picket Fence die along with the Stitched Borders 1. 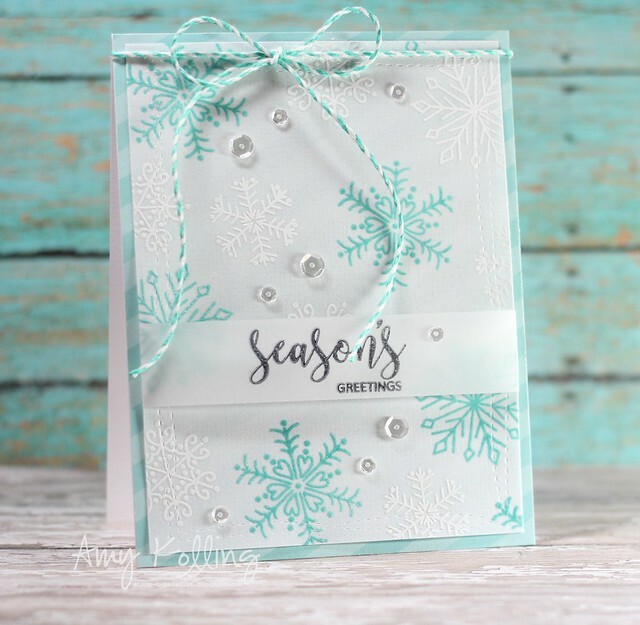 To make my falling snow in the background, I've used the Falling Snow die from Avery Elle. Along the top of the fence and the snowflakes, I've added dots of liquid glue and dusted it with some glitter. 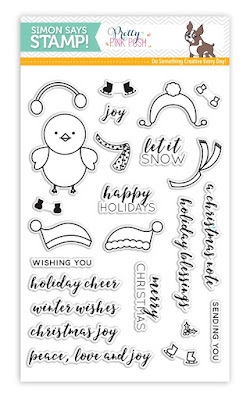 My chick is from the new set, Winter Bird Friend, and was colored/cut out and added with foam adhesive. 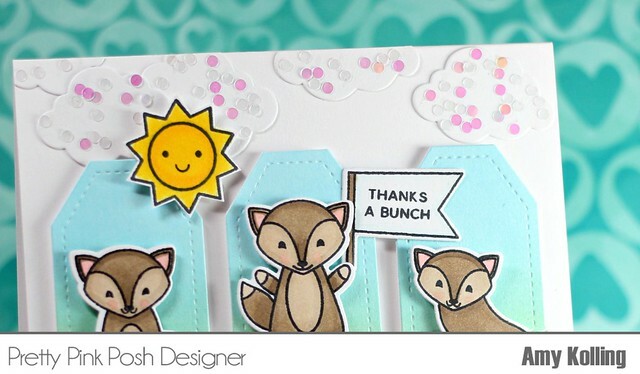 I added a tree from the set called Holiday Pals and my sentiment in a Stitched Speech Bubble die. 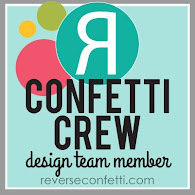 I'm up today over on the Reverse Confetti Blog with an episode of Confetti Camera! 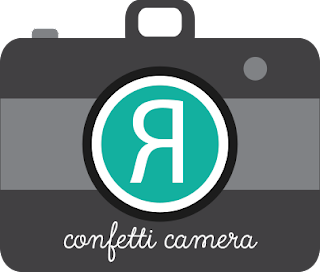 The theme for this round of Confetti Camera is Black/White + one other color! Go check it out and thanks for sharing a part of your day with me! 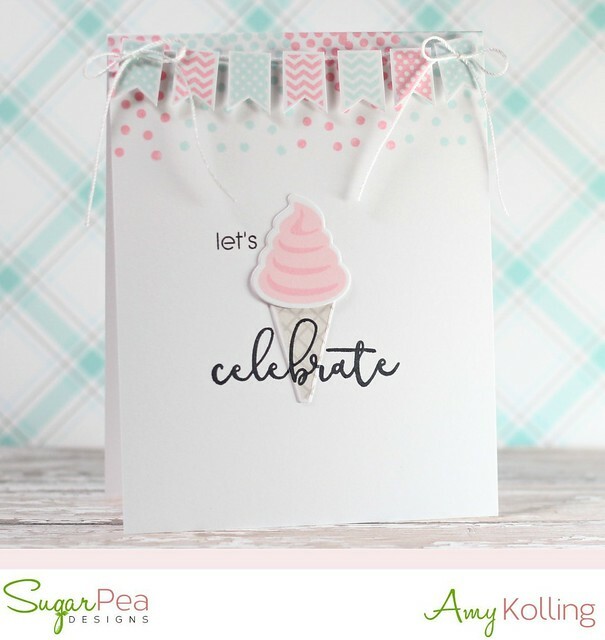 I am sharing this fabulous little Treat Tag and Box Elle-ments today over on the Avery Elle blog. I've assembled it and filled with peppermints. 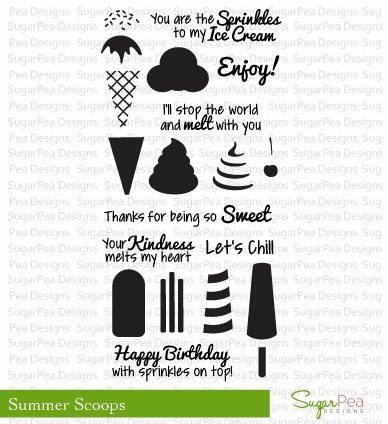 A fun sweet little treat! I just love that this die set has the pierced elements!!! Hello! 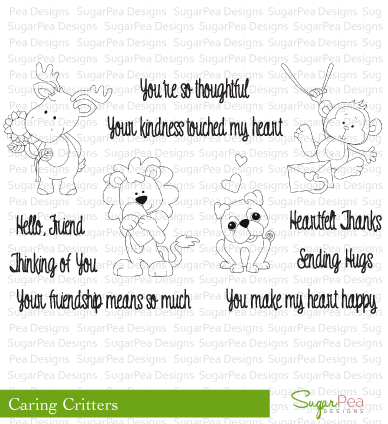 I wanted to share a card using some SugarPea Designs stamps that I've paired with the current CAS(E) this Sketch. I've used the Celebrate All The Things and Summer Scoops stamps and coordinating Summer Scoops SugarCuts. 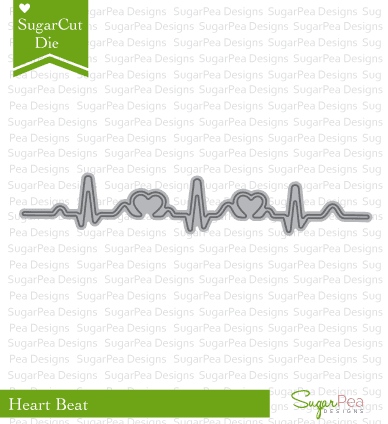 I love creating a simple layout that is so easy to recreate in a pinch. Now that I have made this, I can make others in different color schemes! 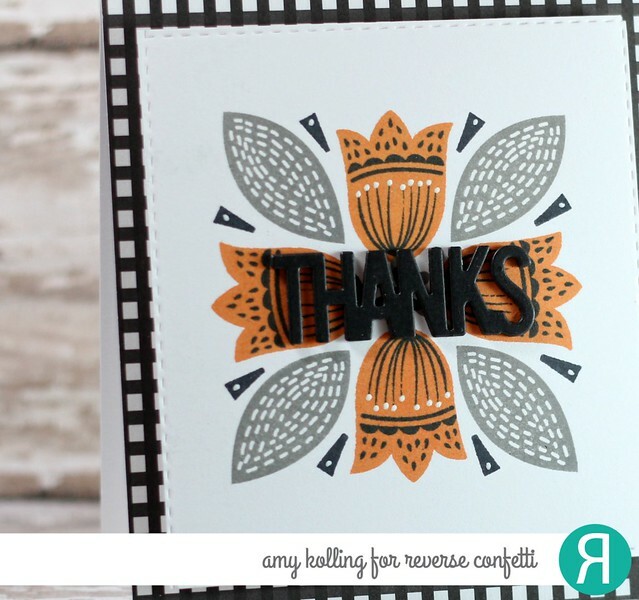 To create my card, I stamped the falling confetti stamp as a border on the top of notecard. I added some stamped and hand trimmed banners with foam adhesive over a piece of white crochet thread. Tiny bows were added with Glossy Accents to the corners. Lastly, I added an ice cream cone that was overstamped with the sentiment 'celebrate'. 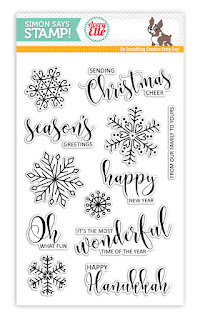 Well.......I'm back for another card to share for Simon Says Stamp Stamptember but this time it's using the exclusive Avery Elle set called Christmas Cheer. 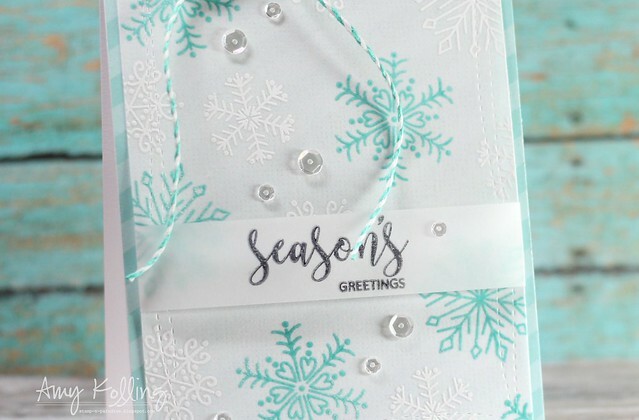 Since this set is so elegant with all the intricate snowflakes, I went with a soft look with some white heat embossing and embossing over pigment ink with clear embossing powder. I used Aquamarine Pigment Ink from Avery Elle to do this!!! 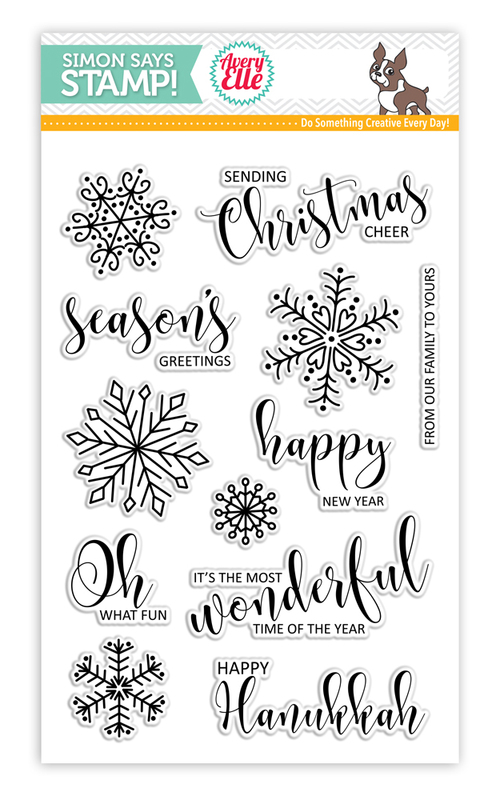 I stamped my snowflake panel onto a very thick vellum cardstock. 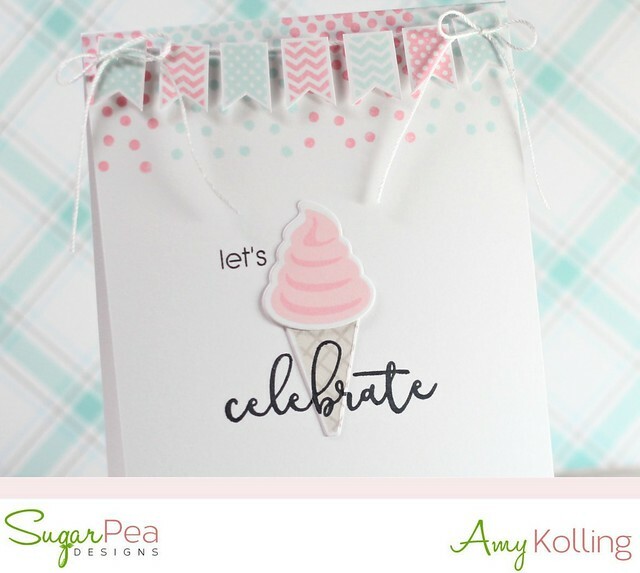 My panel was layered onto a notecard that was covered with an Aquamarine chevron pattern paper from Avery Elle. I added some Sparling Clear Sequins from Pretty Pink Posh and some Aquamarine Twine from Avery Elle. 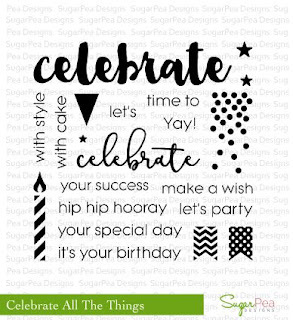 Have you been following Simon Says Stamp and their Stamptember celebrations? 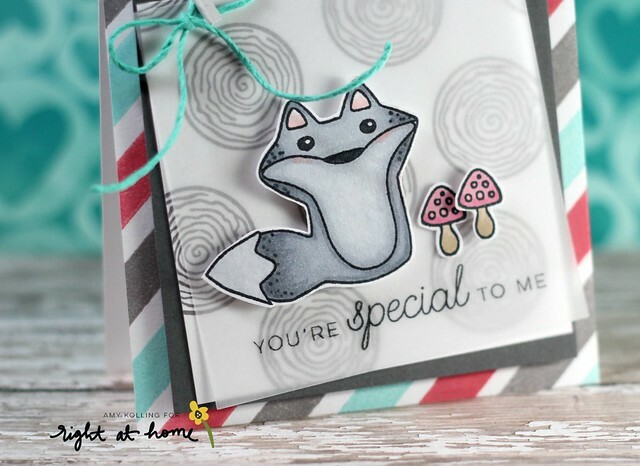 Well, Reverse Confetti had a stamp set release last week for Simon Says Stamp Stamptember called Forest Friends. It is so so ADORABLE!!! I did a fairly CAS take on this months sketch by using some Mustard Seed Distress Ink blending for one of the layers of the sketch. My images were Copic colored and hand trimmed and layered with foam adhesive. I added the clouds with some dimension to represent the row of dots in the sketch. 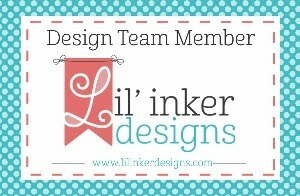 As a final touch, I added red enamel dots to carry the red color throughout my card.